Balis little Sister in the East. In Bahasa Indonesia, the word Lombok means Chili. You can see and taste this everywhere, whether in bushes, in the marketplace or in the Warungs (the local food stalls). Trying one of the traditional dishes really pays off. The majority of the Lombok population (around 90%) are the indigenous Sasak people. Their culture and language is related to the Balinese, but unlike the Hindu Balinese, most people are Muslim and the main language is Sasak. This might be a reason why Lombok is less popular in terms of nightlife activities and shopping. Even if the cultural offer of Lombok, can not compete with Bali, it scores with peace and authenticity. Travellers who are stressed from their everyday lives and don’t want the hassle of big tourist rowds will find a lovely place to relax. The prices are low, the hassling is minimal and the welcome is chary but genuine. The Island is however becoming more and more popular with tourists and honeymooners, especially now since the international airport, only 15min north of Kuta has opened its doors. This could change the laid back atmosphere in the future. But you can still get old-fashioned adventure off the beaten track. The island of Lombok measures about 80km from east to west and roughly the same distance from north to south, with some evergreen landscapes and parts that are permanently dry. Lombok offers some stunning places especially the south caost with its untouched beaches and the mighty Gunung Rinjani, Indonesia‘s second highest volcano, which is considered to be one of the best treks in South East Asia. 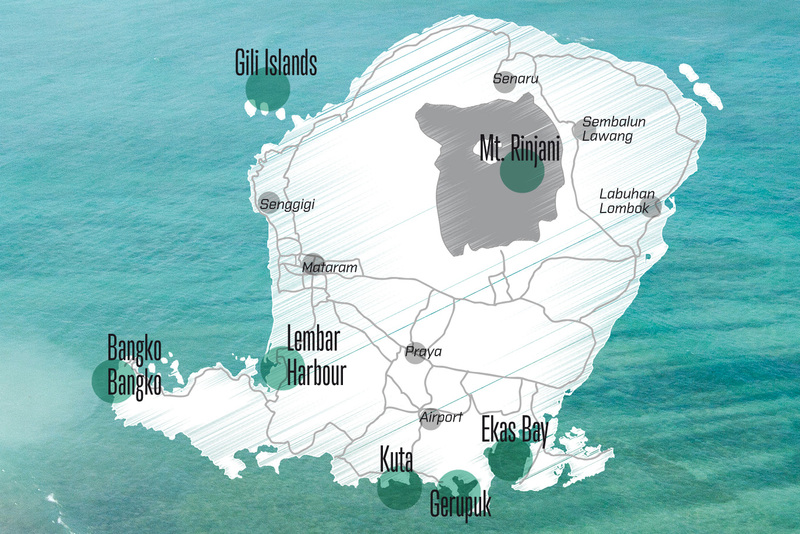 Lombok is surrounded by several small islands with the Gilis, located in the north-west, as the best known of them. Lomboks south coast offers perfect conditions for surfers with spots for all levels. Desert Point is the most famous of them, one of the longest and best left hand Barrels in the world. With its many bays accommodating various swell angles an prevailing wind, it is possible to find good waves all year round. Generally the best time to travel to Indonesia is during the dry season, however most of the spots in Lombok are working best in the wet season from Oktober to April. Some activities at this time like a hike to the summit of Mt Rinjani might not be possible. The numerous surf spots, the beautiful beaches, the good food, the peace and especially the lovely people make Lombok definitely worth a trip.